This week I dropped my Wonder Woman clad, bright-eyed 6 year old off to start 1st grade. Ironically, and only moderately terrifying, I cannot recall who my 1st grade teacher was – no name, face, nothing. Regardless, I can recall with vivid clarity how petrifying it can be diving into a new environment, especially an academic one. In fact, each of us can recall that petrifying uncertainty my 6 year old undoubtedly had this week and students of all ages will experience next week with the start of a new semester. Its no secret that graduate students are a demographically at risk population when it comes to mental health (anxiety, depression etc.) issues. A recent study published in Nature Biotechnology, surveyed over 2200 students from 26 countries and 234 institutions, indicates that graduate students can be six times as likely to suffer from depression or anxiety as opposed to the general population. Cited contributing factors vary, but work life balance is among them, as well as the amount of support mentors provide to the students. Graduate school is competitive, taxing, physically exhausting, and lonely at times. When Monday rolls around and new faces inundate our campus, it’s our collective responsibility, as faculty mentors, senior graduate students, and support staff to create a culture and community that isn’t isolating, but rather supportive. It might help the process if you see each of them as a 6 year old Wonder Woman - slightly hesitant, but with a little support, very capable of reaching their potential. Computing in Life Science (CS59000-CLS) will be offered in this Fall 2018 semester. This course is for students majoring biology and related research areas. It covers bioinformatics methods and software, and introductory Python programming, which is very useful and nowadays essential for data analysis in wet lab experiments. No prior programming skill necessary. We are announcing the Purdue Cryo-EM Symposium to be held on November 6-8 2018. The goal of this meeting is to gather cryo-EM enthusiasts from around the globe to discuss topics including sample preparation, data collection, image processing and applications of cryo-EM. We will be hosting a range of speakers that will share their recent progress and developments. Application deadline is Friday, August 31. More details can be found in the website of the symposium. Continuing with our mission of enhancing drug discovery capabilities at Purdue, the Institute for Drug Discovery has completed the installation of the infrastructure to support the synthesis of radioactive materials for imaging applications in the MiLabs Vector SPECT/PET/CT instrument. 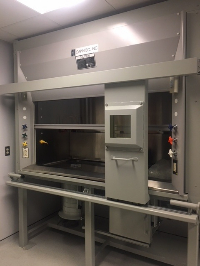 To safely synthesize the PET and/or SPECT probes necessary for imaging, a lead lined fume hood with an integrated dose calibrator has been installed. Additionally, a lead-lined cabinet for the short term storage of cages containing small mammals dosed with radioactive materials has also been installed. These infrastructure improvements now will allow for the synthesis of radioactive compounds and the injection, imaging, and storage of small mammals all in a localized area. The hood, animal cabinet, and Vector imaging instrument are all part of the Imaging Facility located in Hansen B032. For additional information on usage, please contact imaging facility director Andy Schaber (schaber@purdue.edu). August 29th, Akina will be hosting a free 1-day scientific networking conference in Kurz Purdue Technology Center (KPTC) in the Purdue Research Park. Check out their website for information on this event. The annual Institute for Drug Discovery symposium brings together Purdue faculty, students, and staff with external drug discovery experts through keynote talks, quick talks, poster sessions, dinners, and mingling events. This year’s 5th annual symposium corresponds with Purdue’s 150th Anniversary celebration and to commemorate the event, three external keynote speakers will be presenting including Dr. Min Li, Vice President at GlaxoSmithKline, Dr. Shaomeng Wang, Professor/Director of the Molecular Therapeutics Program/Director of the Cancer Drug Discovery Program at University of Michigan, and Dr. Philip Cole, Professor at Harvard Medical School. Please plan to join us on Friday, September 28 from 9:00 a.m. - 5:00 p.m. in STEW 218. Dear PI4D members and friends, as we embark on a new academic year, I’m excited to tell you that PI4D and the Women’s Global Health Institute (WGHI) have created a strategic alliance and joined forces. The WGHI and PI4D share core mission objectives that seek to combine technology and engineering with life scientists to develop platforms for early detection of diseases. This union opens a women’s health research chapter for PI4D and we are excited for the opportunity of working closely with WGHI leadership to start this new endeavor. Andrea is a third year PhD student in nutrition science at Purdue University. She received her bachelor’s degree in dietetics and master’s degree in foods and nutrition from The University of Georgia, and she is a registered dietitian nutritionist. Her research interests include studying how our diet, especially mineral intake, both in childhood and adulthood affects our risk for developing chronic diseases such as heart disease, osteoporosis, and diabetes. Her career goal is to be a professor in nutrition, which would include both conducting research and teaching nutrition courses. She is passionate about nutrition and about educating others to help them adopt a healthier lifestyle. When she isn’t working, Andrea enjoys cooking, swimming, and playing with her dog, Piper. 2018 Linda and Jack gill Graduate Student Award: application deadline is Friday, August 24th. Welcome to a new academic year! We are excited to inform you that PIIN’s administrative headquarters are located on the third floor of the Hall for Discovery and Learning Research (DLR). We would also like to welcome Dr. Jason Cannon, Dr. Aaron Bowman, and Dr. Yang Yang who have successfully moved their laboratories into the third floor of DLR. We have planned a number of events and initiatives, so be sure to check out the events section of the website. We would like to recognize two participants of the Summer Research Opportunity Program (SROP) students, Zoe Cubero and Lucas Mondo who worked in the Neuroscience Cell Engineering Core, under the guidance of Jung-il Moon. These students successfully presented their research projects entitled “Fate change of Megaptera novaeangliae whale fibroblasts” and “Cell Fate of Whale Fibroblast” at the end of the 8 weeks program. In an effort to improve graduate education in interdisciplinary neuroscience and compete for NIH institutional training grants in the future, Peri Paschou (BIOL) is organizing a new team-taught graduate course: BIOL69500, Neurological and Neuropsychiatric Disorders Seminar. Please check your email for further details about this 2-credit course. It will meet Tues-Thurs 1:30 - 2:30 pm in Lilly G458 in the Fall 2018. The Michael J. Fox Foundation is accepting pre-proposals for its CoreFunding Programs (Target Advancement, Therapeutic Development and Outcome Measures). Pre-proposals are due in late September, 2018. September 24: The Purdue University / Indiana University Joint Symposium on Brain and Spinal Cord Injury Research is just around the corner. Registration is required, and the deadline is Friday, August 31. You should have received an email from us asking for your updated biosketch and lab personnel information by August 31, 2018. If you have not seen this email, please check your spam filter. Reminder: Please add the ‘Cc-participants@lists.purdue.edu’ email address to your spam filter whitelist. If you have any questions on how to do this, please contact John Fry, johnfry@purdue.edu or 496-3993. Our internal Shared Resource Projects funding opportunity is currently open. Proposals are due September 3, 2018. The “Walther Oncology Physical Sciences &Engineering Research Embedding Program” is holding its third round of call outs for the Walther Embedding Tier One projects. The deadline is October 15, 2018. September 13: Dr. Kevin Camphausen, MD, will be giving a talk titled “Development of Glioma Therapy using Omics Technology” at 11:30 AM in the Drug Discovery Lobby Conference Room. September 20: Dr. Christine Schaner Tooley, Ph.D., will be giving a talk titled “NRMT1 and Cancer: Misregulation, Mutation, and More” at 11:30 AM in the Drug Discovery Lobby Conference Room. Min Zhang is offering a STAT 598 course this semester focusing on “Big Data in Cancer Research”, please go here for more information. We'd like to provide a warm welcome to Maralee Hayworth, who has joined RCHE as Operations Manager. Maralee was previously a business manager in Discovery Park. She is a Purdue graduate, holding an MBA and BS in Organizational Leadership. We are very happy to have her as a part of the team and are looking forward to the leadership she will help to bring to RCHE. Additionally, Programmer Analyst Jenna Moretti is moving with her family to Peoria Illinois, and her last day at RCHE was August 14. We are all extremely sad to see her go, but wish her all the best in her new career. Finally, Zach Hass has joined RCHE as the first core faculty member. Zach received his PhD in statistics from Purdue University and will serve as an assistant professor in the Schools of Nursing and Industrial Engineering. His research interests are in the areas of health services research and applied statistics. Purdue University's Dean of Engineering, Mung Chiang, made a commitment of five faculty positions in the College in support of RCHE’s efforts. Zach is the first of this commitment of core faculty, and four additional faculty will be hired over the next three to four years. RCHE will begin its search for additional core faculty this month. We are seeking a highly qualified individual with expertise in data science applied to healthcare, and in particular, healthcare-related devices and monitoring. Areas of emphasis include deep learning, explainable artificial intelligence, causal inference, predictive analytics, transportability of causal and statistical relationships, connected care, IoT analytics, and remote monitoring/ point of care analytics. Candidates must hold a Ph.D. in biomedical engineering, computer engineering, computer science, electrical engineering, industrial engineering, mechanical engineering, statistics, or a related field. Questions regarding the position may be addressed to the chair of the search committee, Paul Griffin - paulgriffin@purdue.edu.